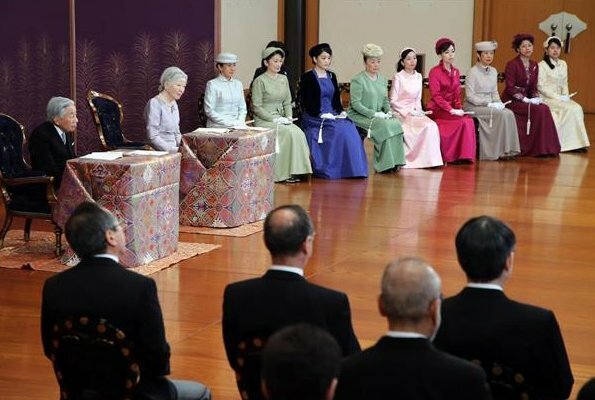 On January 10, 2018, Japanese Emperor Akihito, Empress Michiko, Crown Prince Naruhito, Crown Princess Masako, Prince Akishino, Princess Kiko, Princess Mako, Princess Nobuko, Princess Akiko, Princess Yoko, Princess Hisako, Princess Tsuguko and Princess Ayako attended the ceremony of the Kousho Hajime held at Imperial Palace. 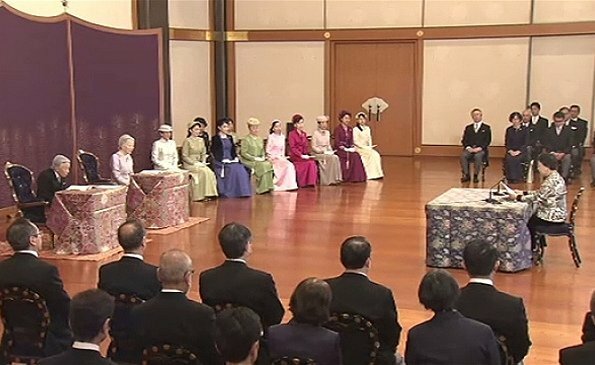 The Ceremony of the Kousho Hajime (Imperial New Year's Lectures) takes place every January at the Imperial Palace in the presence of the Emperor and Empress. 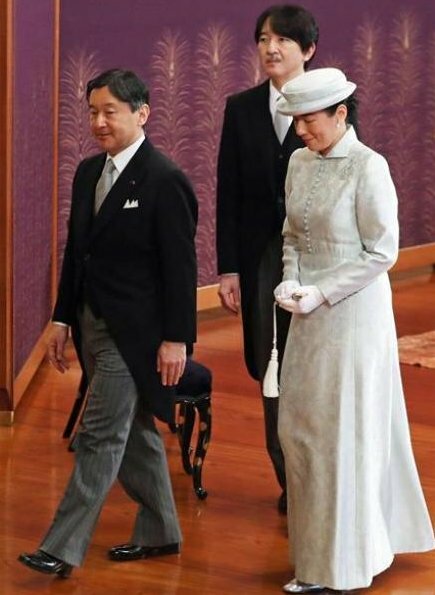 Crown Princess Masako attended for the first time in 15 years. Every culture has its customs but this makes me sleepy just looking at it. But I do love the oversized wrapped gift boxes they use for tables. Why not real furniture? And the way the ladies all hold their fans(?) exactly the same way? 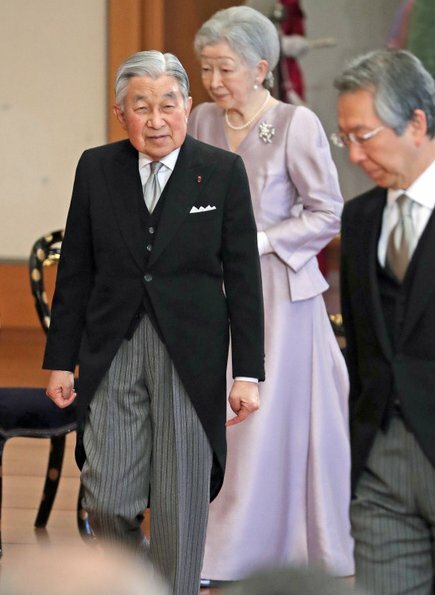 Everything about the Japanese Imperial Family is very regimented. I am surprised to see so much color in the dresses, they are usually much more sedate. Yes, several colours and shades but most of them are really old-fashioned. Ces boîtes-tables sont affreuses. Quel mauvais goût! Empress looks good, princess Kiko almost. Masako´s hat is so ugly. And they are so stiff and controlled it is hard to look at. In the third photo, all three look like they're attending a funeral. And oh my, that chamber-pot hat! My God!Cérémonie d'un autre temps qui doit être profondément ennuyeuse. Ne parlons pas des boîtes qu'ils ressortent tous les ans. L'agence impériale devrait évoluer. It's an extremely slow process. 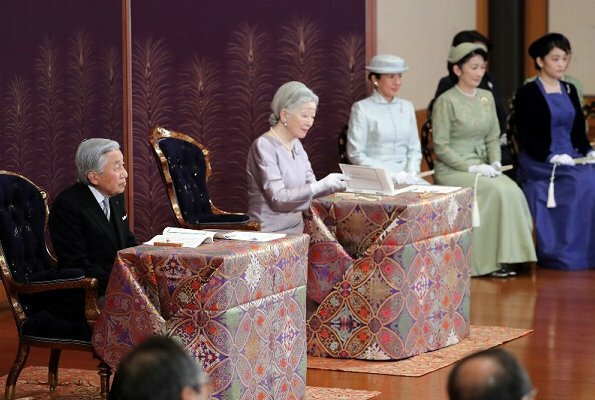 CP Masako will be Empress in a little more than one year's time, so there is hope that with the beginning of the reign of Emperor Naruhito we will see more change to the Imperial House of Japan. Until then, clearly not, everyone carries one as before. 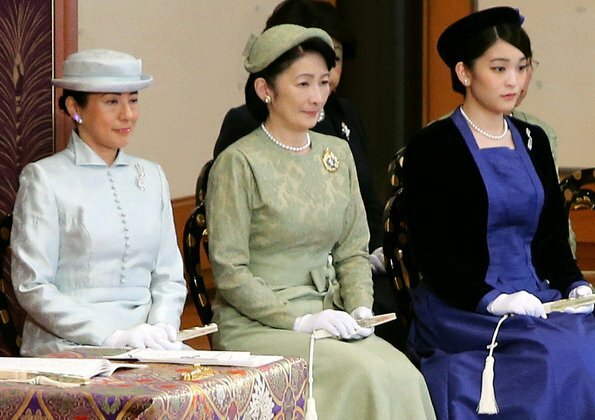 It's also because of this taking over of the Chrysanthemum Throne that Masako is more present at functions more recently. The royal family is VERY controlled. Masako has had a hard time as her mother-in-law did before her. I guess Jean Francis and DSC you are unfamiliar with her since she was married. It is actually a very good and happy thing to see her at more events. Anyone would have a very hard time living a free life only for that to be completely taken away on marriage besides the pressure to produce an heir. Her mother in law had the same reported difficulties including problems with the Emperor's mother.